The most important part of any fire safety precautions is a working fire detection system. The type, quality and what this is made up of depends upon the risk and premises involved. Fire detection systems, no matter how simple are mechanical devices that are prone at some stage or another to breakdown and/or tampering. A fire detection system that is not working in an HMO for example or another premises with sleeping life risk and sometimes other premises, will almost certainly mean an instant prosecution from the fire authority or housing authority where relevant. A fire death or fire related injury as a result of a fire detection system not working will normally mean prison and/or a heavy fine for the responsible person/persons unless they can demonstrate that they had suitable measures in place to ensure adequate maintenance and testing of the fire detection system and perhaps that other fire safety procedures were in place. While it is perhaps the most important aspect of fire safety, the fire detection system is by no means the only measure which needs to be maintained and inspected regularly. What does the law say about fire detection system testing? Essentially it must be ‘suitable and sufficient’!! This is effectively how the Regulatory reform (fire safety) Order 2005 works……..
How would a fire authority or housing authority decide if it was suitable and sufficient and how would a judge and prosecution council in a court of law decide if it was suitable and sufficient? They’d look at the accepted guidance – at the moment BS5839 part 6 and for HMO’s the LACORS guidance which essentially with regard to fire detection systems means BS5839 part 6. If this guidance is not followed and something goes wrong a responsible person (landlord etc etc) will need to justify why the have deviated from accepted British Standard guidance. This may be a difficult thing to argue unless a suitable and sufficient fire risk assessment has been carried out which would justify any deviations from the accepted procedures. Its important to also understand that fire safety issues are NOT enforced by any organisation other than the fire authority (fire and rescue services), the housing authority’s, and/or the Health and Safety Executive (HSE). While some organisations may give fire safety guidance and even advice, ie University’s housing offices, Landlord Associations, Business Groups etc, they don’t make and more importantly don’t enforce the rules. Ensure you know what your doing when it comes to managing fire safety or perhaps get some help to do it for you. The main types of system to be concerned with are Grade A and Grade D systems depending on the risks concerned. (essentially the higher the risk, the better the system. Grade F, battery operated domestic type, should NOT be installed and/or relied on in any premise that is covered by the Regulatory reform (fire safety) Order 2005 or Housing Act 2004 (unless its your own home). Grade F fire detection systems represent the bare minimum for your own home or single occupancy dwellings only. We categorically do not advise at all that this is acceptable for a rented single occupancy dwelling! Fire detection system guidance on testing……. All Grades of system need to be tested periodically to ensure that there has not been any major failure. This does not require any specialist knowledge, and can normally be carried out, quite easily, by the occupier of the dwelling, who will, however, need simple instructions in how to do so. The following recommendations are applicable. a) Instructions to users should stress the importance of routine testing of the system (see Clause 24). carried out by use of a test button on each of the smoke alarms and heat alarms installed in the dwelling. 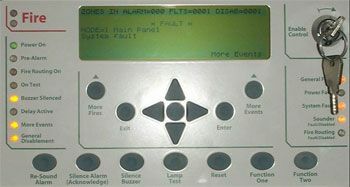 the system to permit routine testing without the need to access test controls on the smoke or heat alarms themselves. provided) could have failed, the occupier should check immediately on reoccupying the dwelling that the system has not suffered total power failure. It is essential that the system is subject to periodic inspection, so that unrevealed faults are identified, and, in the case of more complex systems, so that preventive measures can be taken to ensure the continued reliability of the system. In dwellings in which a Grade A system is provided, periodic inspection and servicing needs to be carried out by a competent person with specialist knowledge of fire detection and fire alarm systems, including knowledge of the causes of false alarms, sufficient information regarding the system, and adequate access to spares. This will normally be an outside fire alarm servicing organization. Competence of a fire alarm servicing organization can be assured by use of organizations that are third-party certificated, by a UKAS-certificated certification body, to carry out inspection and servicing of fire alarm systems (e.g. certificated under the British Approvals for Fire Equipment (BAFE) SP 203 scheme or the BRE Certification LPS 1014 scheme). a) Grade A systems should be inspected and serviced at periods not exceeding six months in accordance with the recommendations of Clause 45 of BS 5839-1:2002. An inspection and servicing certificate of the type contained in G.6 of BS 5839-1:2002 should be issued. In houses in multiple occupation, batteries in any radio-linked devices (such as manual call points, automatic detectors and fire alarm devices) should be changed by the servicing organization before the low battery warning condition recommended by 27.2b)3) of BS 5839-1 is likely to be given. inspection and test certificate issued. What ever type of system you have it needs testing!! We offer testing packages for all systems and can provide full annual and 6 monthly servicing as well as any relevant monthly or more frequent tests that are required to be provided. We currently are offering monthly fire alarm testing packages, for example on HMO's. Please get in touch and ask us about how we can help…….